The next time you find yourself traveling through the vast countryside of the Netherlands, take note of the many different kinds of cheese each region has to offer. From creamy to pungent, Dutch cheese is an art of its own. Let’s explore! Leidse kaas is the most famous type of Leyden cheese as it contains ground cumin seeds. The cheese is round and flat, similar to Gouda, but it contains a surprisingly low-fat content. Leidse Kaas originated in the farmlands surrounding the city of Leiden. It’s best enjoyed alone or with hard crackers and good wine! A blindfolded taste tester might turn her nose to this odorous cheese. However pungent, Limburger kaas is actually a very mild, creamy cheese comparable to a French Munster. Originally produced in the Duchy of Limburg during the 19th century, Limburger kaas is traditionally eaten with hard, crusty bread and sauteed onions! This well-known cheese has been produced in the Netherlands since the Dark Ages. Its creamy, soft texture makes it the perfect sandwich companion and is commonly served as a snack throughout Holland and the Netherlands. It pairs beautifully with dark beer and other varieties of Dutch cheese! 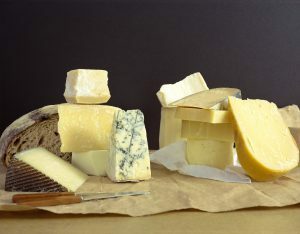 Geitenkaas literally translates to “goat’s cheese”, but should not be confused with chevre or feta. This Dutch cheese is significantly harder than most goat’s cheeses you may have tried before. With a distinctive, mellowed tang, Geitenkaas pairs well with dried fruits and sparkling wine! Boerenkaas, much like Leidse kaas, shares similarities to Gouda. However, this particular cheese must be produced under specific traditional conditions that are regulated by the European Council. Traditional Boerenkaas is made from raw, unpasteurized milk and prepared on a dairy farm. Enjoy with a peppery Pinot Gris! AESU offers several trips to Holland, including Euro Spree, Euro Focus, and our most popular tour, Great Escape. Explore Holland and its rich history and culture. This entry was posted on Wednesday, June 14th, 2017	at 1:57 pm	. You can follow any responses to this entry through the RSS 2.0	feed. Both comments and pings are currently closed.